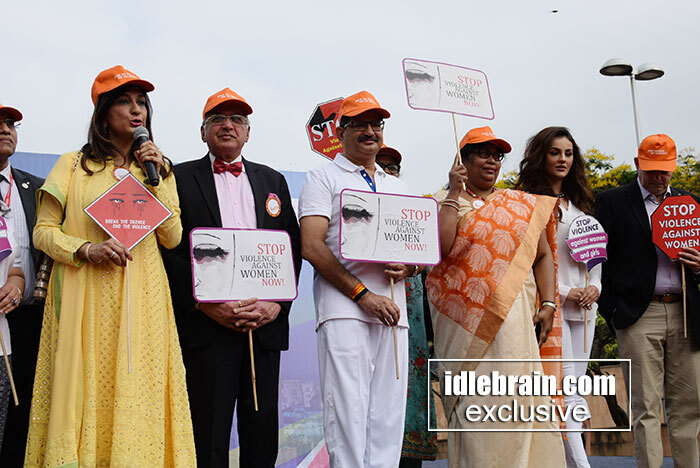 The Bikethon in the city flagged off today by Anurag Sharma, IPS Director General of Police, and Bollywood actress Seerat Kapoor included hundreds of doctors, youngsters, men and women from all walks of life carrying a message to ‘Stop Violence Against Women (VAW)’. The Bikethon was part of the FOGSI-FIGO 2017 International Conference on Clinical Challenges in Obstetrics & Gynecology being held HICC from 4th – 6th August 2017. The Federation of Gynaecologists of India and FIGO the international body of worldwide Obstetricians and Gynaecologists who organised this forum reiterated their commitment to speak up, focus and work hand in hand with all the stakeholders to tackle this issue. Lauding the DHEERA campaign launched by FIGO and FOGSI, DGP Anurag Sharma said ' It is a very noteworthy campaign and the message 'Stop Violence Against Woman' (DHEERA) launched through the support of 34000 strong gynaecologists from India. needs to be taken up seriously by all of us and the society. In her address Seerat Kapoor she said " I honestly believe and strongly support gender equality. I do stand by woman empowerment , I do feel any society to progress this aspect of gender equality needs to be taken very seriously. I am hopeful through this 'Stop Violence Against Woman ' DHEERA campaign we will be able to accomplish the cause that has been taken up by FIGO and FOGSI today. I am also very delighted to see so many people have come to support this cause." Dr. S. Shantha Kumari, Member, FIGO Working Group on Violence Against Women (VAW) who launched this initiative titled DHEERA, “Say No to Violence Against Women” at National Conference held on 27-28 August 2016 at Hyderabad India had garnered tremendous response and support. Talking about DHEERA and thanking DGP Anurag Sharma, Dr. Shantha said “As obstetricians and gynaecologists we are in a unique position to assess and provide support for women who experience violence because of the nature of the patient–physician relationship. We also understand that men are important partners (Men as partners) in preventing violence against women (VAW) and hence there is a need for an integrative approach to tackle this concern. This vital issue also need constant support from both the central and state governments and most importantly the law enforcement agencies. Violence against women prevalence in India is 35.1%. The latest NFHS-4 survey in state of Telangana shows 43% of women experienced spousal violence and 5.9% experienced violence during pregnancy. Violence is a consistent and strong risk factor for unintended pregnancy, induced, unsafe abortion and severe morbidity. At the bikethon FOGSI-FIGO members urged participants at the event and the society in large to speak about this burning issue to spread awareness and reclaim focus. Earlier Unveiling the agenda for the conference Dr. S. Shantha Kumari, Organising Secretary, FOGSI FIGO, Member, FIGO Working Group on Violence Against Women's health said “Well being has been always the priority of our specialization. Our aim at this conference is to devise Sustainable Development Goals to enhance quality and inject steps forward in tackling women healthcare.